Onions come in many different shapes, colors and sizes. For all types of onions it is important that you avoid onions that have cuts & bruises, sprouting and any type of mold. Also check the neck of the onion, this should be firm and not soft. All of these signs point to an onion that is starting to decay. Ideally you onions should have a dry brown crackly shell on the outside. Yellow Onions: Perhaps the most popular onion. Adds great flavor to stews, soups, and meat dishes. White Onions: A more mild flavor compared to yellow onions. If you don’t want a strong onion flavor use white onions for your dishes. Properly bought onions can last up to 6-8 months when stored correctly. We want to store our onions in a cool dark place and out of sunlight. They should not be put in the fridge as this will result in spoilage. Onions should always be stored separately and away from other produce. This is to avoid unnecessary spoilage and keep the other produce from absorbing the onions flavor. 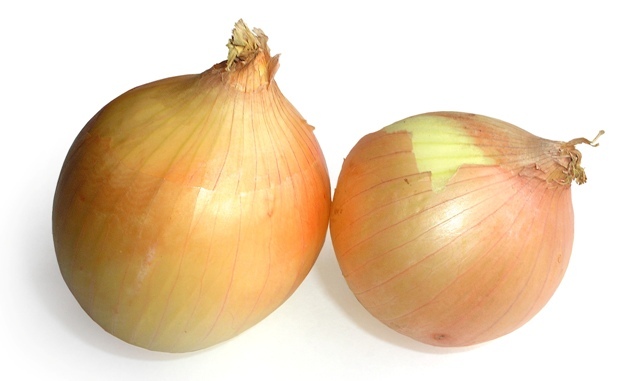 Cut or partial used onions should be stored in the fridge in a tight plastic container. This will allow you onion to stay fresh till your next recipe. Tip: If you don’t care about decor, use new pantyhose and tie a knot in between each onion. Do Not Store Near Potatoes: The potatoes will absorb the water from your onions causing both of your vegetables to spoil. Never Store In Plastic Bags: This prevents air flow and will cause your onions to spoil much much faster. Eat Slimy or Discolored Onions: These have likely gone bad and are not good to eat. Its best to toss them in the composte bin.